All your verification-related settings are under “My Personal Data” → “Security”. PINs are 6-digit codes: you can set them once and they can’t be changed. Withdrawals PIN: necessary to perform withdrawals; if it is not supplied, you won’t be able to withdraw any balance. Trading PIN: necessary to create orders and perform trades; you can set a maximum TTL (time in which it won’t be asked again). 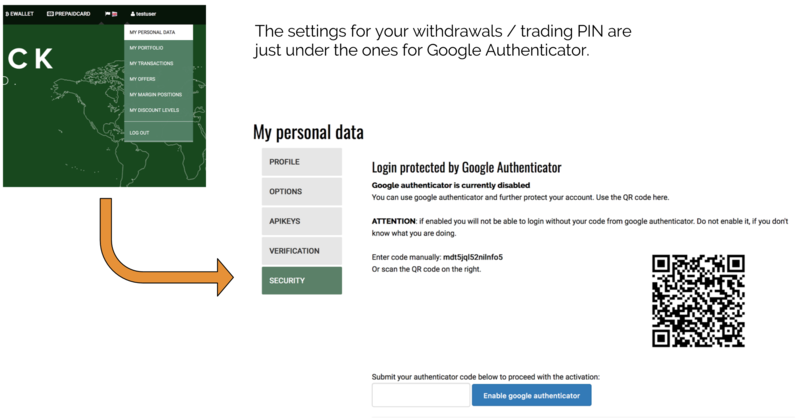 If you want to use 2-factor authentication, you can use the Google Authenticator app or similar solutions; be aware that you can’t transfer your 2-factor code from Google Authenticator to other apps. You might want to use Authy, since it can provide sync across multiple devices.